Don’t you just love roasted vegetables? Here is an old favourite of mine using Sweet Potatoes, Carrots and Parsnips. It’s a really easy recipe you can quickly prepare and throw into the oven. An ideal dish to make on Sunday night as it is delicious served hot as a side dish or served cold the next day as a salad. You can vary the type and quantity of vegetable to suit. For a lower carb option try it with pumpkin or squash. The recipe calls for Basil Pesto – if you make your own that’s perfect and use good quality olive oil. Otherwise make sure you read your store bought pesto label to ensure you are not buying something with horrible industrial seed oils like canola or sunflower oils. 1tsp Turmeric – or you can vary your spice, depending on taste and try using chilli powder, or cumin. 3 tbsp Basil Pesto – preferably home made, or chose a brand that uses olive oil. Peel and wash sweet potatoes, carrots and parsnips. Slice into even sized chunks. Add vegetables to a large baking or roasting dish. Pour over the oil and sprinkle over your chosen spice, salt and pepper. The vegetables will be cooked when they are soft on the inside, (test with a fork), and lightly browned on the outside. Baking times will vary and depend the size of your vegetables. Mix through the basil pesto. 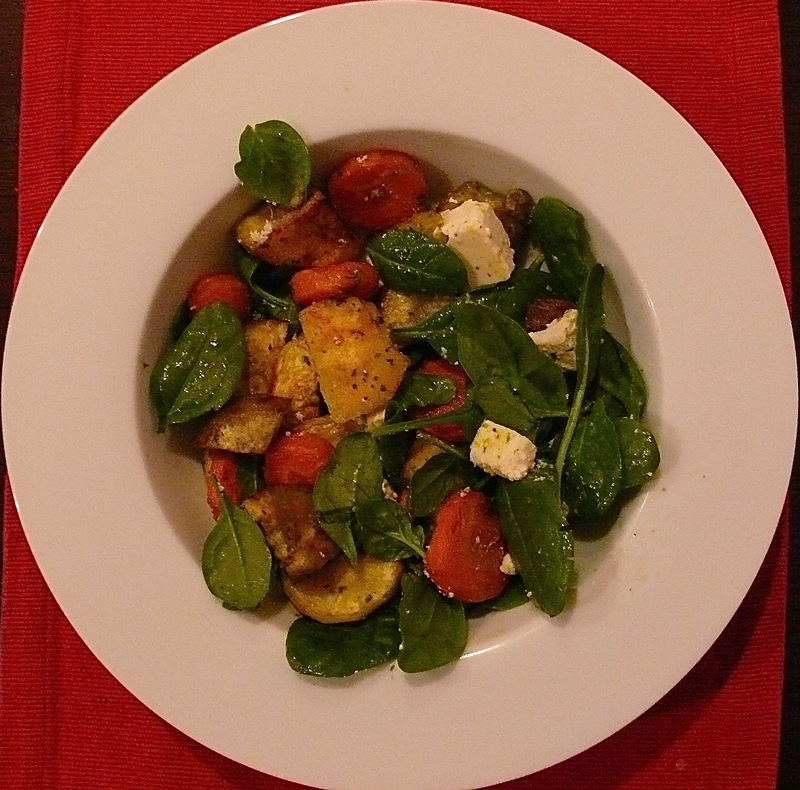 Arrange spinach on a serving dish. Gently mix in the fetta. If you do have leftovers that you don’t plan to use for lunch then fry them up with some butter and bacon for a breakfast hash!